Did you ever buy a fabulous dress in blazing orange only to realize you can’t wear it again for the next decade or so, because everyone will remember it? This is my dilemma with plates! You see, I’m a pattern girl. 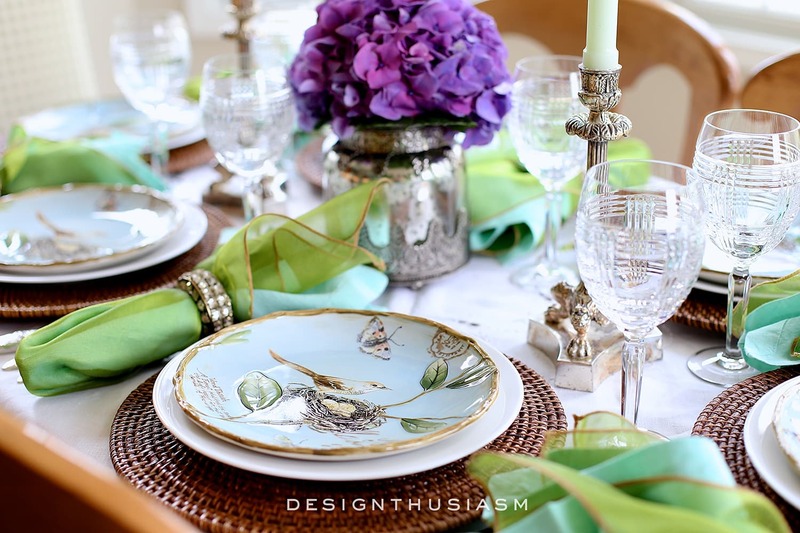 Most of my tablescapes are centered around lovely, intricate, conceptual patterns and they tend to be memorable. 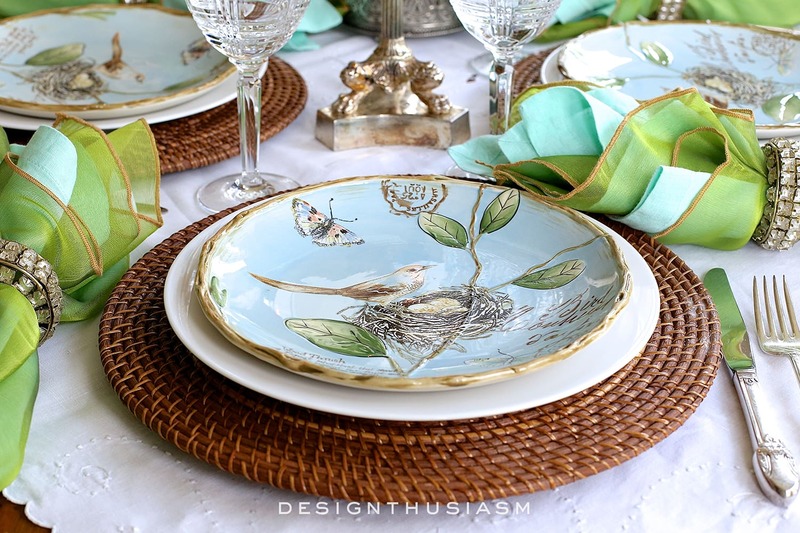 So I wanted to address the challenge of re-using patterned plates with a completely new look. The plate in question, in this case, is the Fitz and Floyd bird salad plate from the Toulouse Blue Collection. I used it last spring in one of my most popular table settings, A Springy Seder, and haven’t used it since for fear of being too repetitive. Yet I felt it’s ridiculous to have this wonderful seasonal plate and not use it, so I challenged myself to style a table repeating the same plate but with a very different aesthetic tone. I went with a crisp underpinning of vintage white embroidered tablecloth, the perfect backdrop off which to bounce the pop colors. 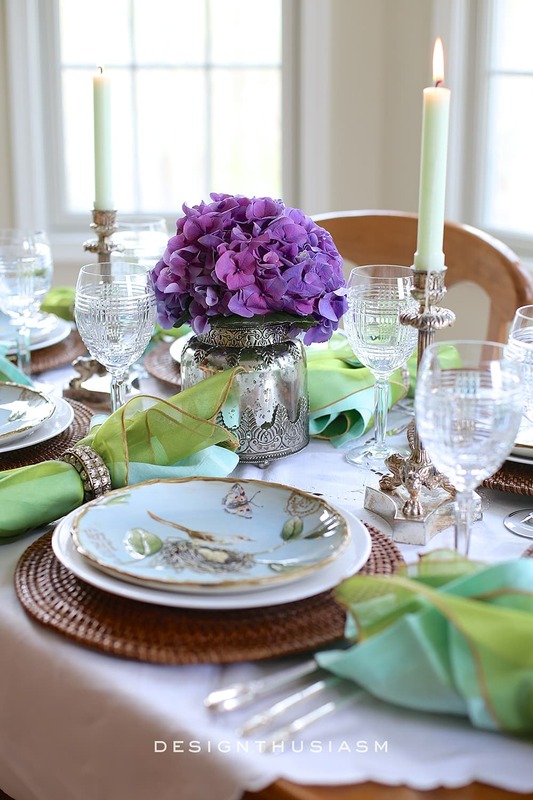 The napkin pairing layered a lush aqua linen from World Market under an iridescent green from Pier 1, clustered together by a chunky crystal napkin ring from Pottery Barn. Vibrant purple hydrangeas offer another splash of color, further setting the table apart from its more organic predecessor. 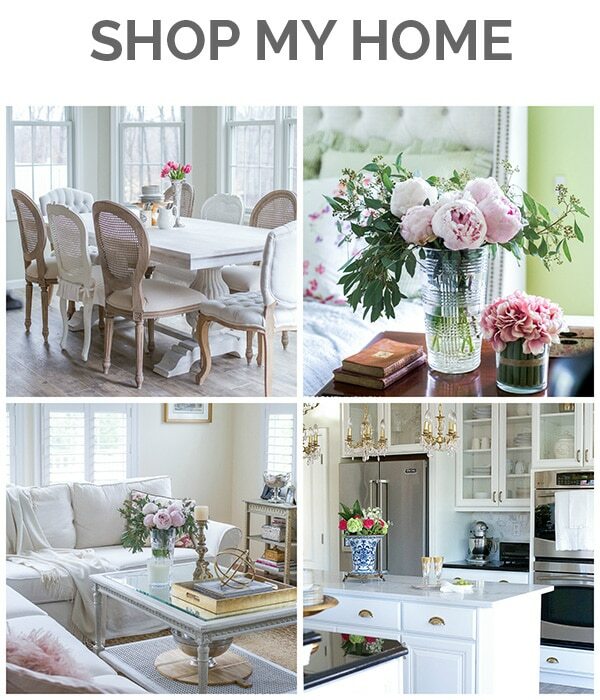 The floral sits in a mercury glass vase from Pottery Barn. Ralph Lauren Glen Plaid goblets bounce light around the table and sit nicely against the silver candlestick holders. The tiny bit of pink in the butterfly on the plate hints at yet another color way I can focus on in the future to reinvent this bold pattern again. 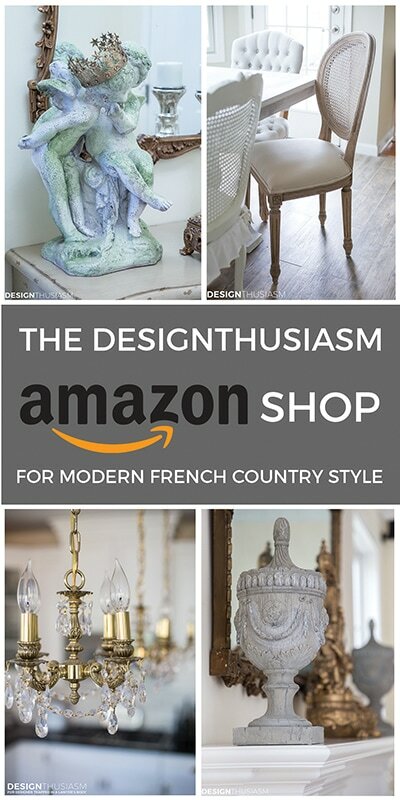 Rattan chargers are from Pier 1 and ground the whole look by providing a rich foundation. 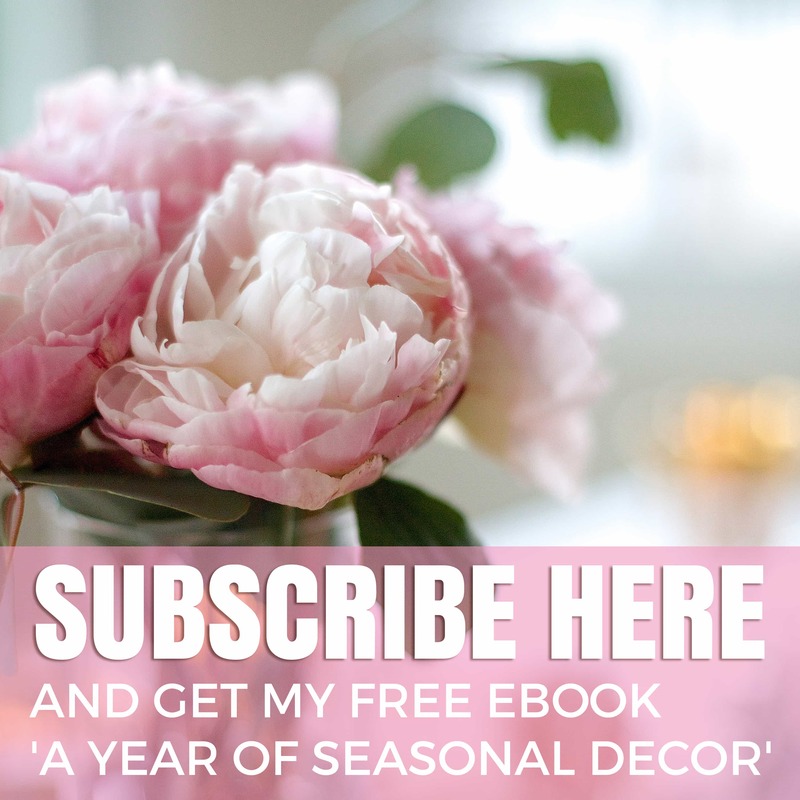 Color is, without a doubt, the single most effective way to transform your decor, whether it be a room that needs refreshing or a patterned piece that’s wanting an update. By seeking out and capitalizing on the subtle accent colors, you can completely rework a very dominant look. The reason why I decided to follow you? 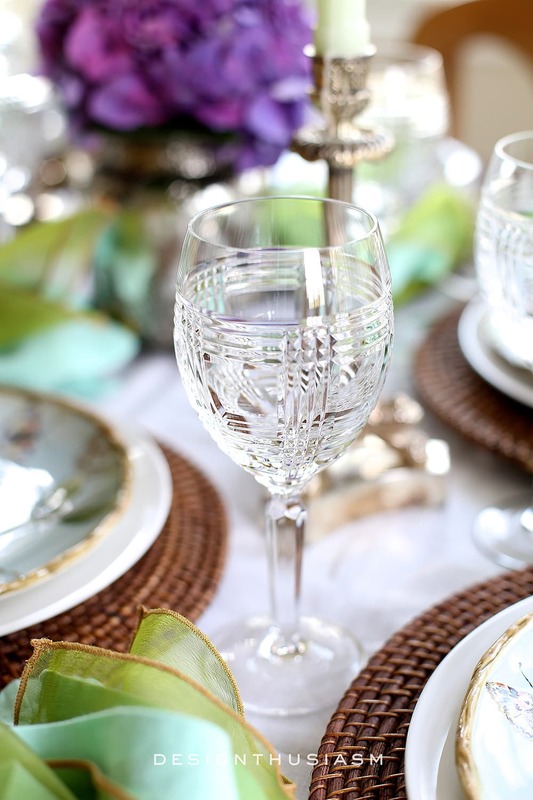 Your tablescape… always beautiful ! Lory, I’ve seen those plates before and always thought they were gorgeous! I’m glad you’re figuring out ways to use them often. Your table setting is lovely. I’m looking forward to seeing you use them again! Beautiful! 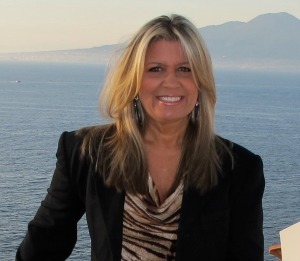 Thanks, Lynda! I’m definitely thinking along the lines of pink for next time, but that one will be a little trickier… 😉 Stay tuned! Thanks for visiting!! I love how you repurposed the plates by pulling out a different color way! Now, I need to go through my dish cupboard and try the same! Thanks, Valerie! This has been a big challenge for me, so I’m really glad I was able to make it work and look different. So glad you felt inspired… 🙂 Thanks so much for visiting!! So very beautiful Lory! 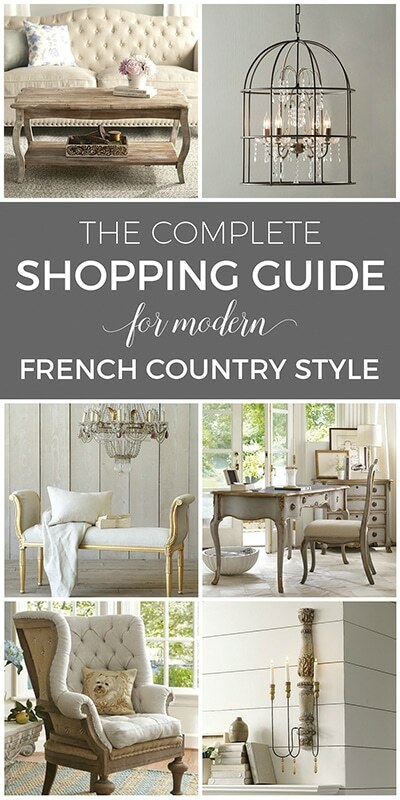 … Casual, yet sophisticated! 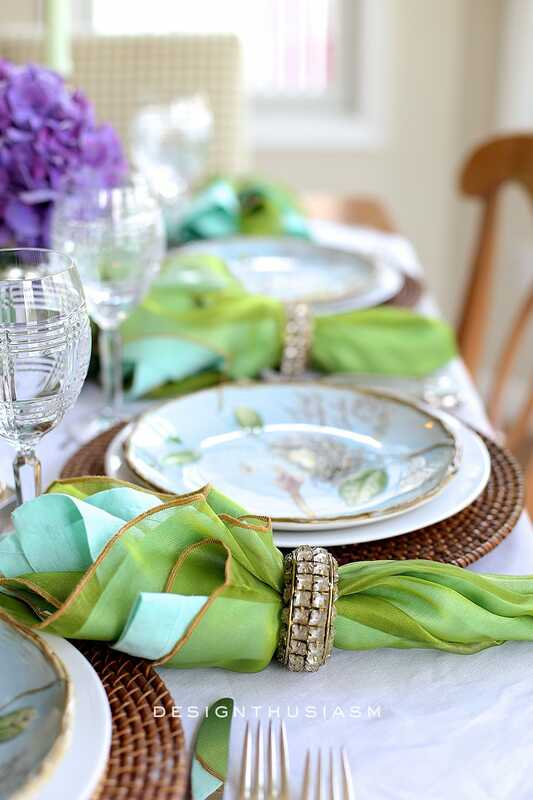 Your tablescapes are always so pretty!!! Purple hydrangeas are my favorite of this flowering shrub. Changing out the accessories is something my mom always did to give the china sets a new look and, like you, she could really pull a look together. Thanks, Bobbi! I’m having a bit of a love affair with purple hydrangeas this year, too… 🙂 I’ve always been all about the blue, but these purple ones are so lovely!! Thanks for stopping by! Beautifully done! Great mix and I like how the green pops. 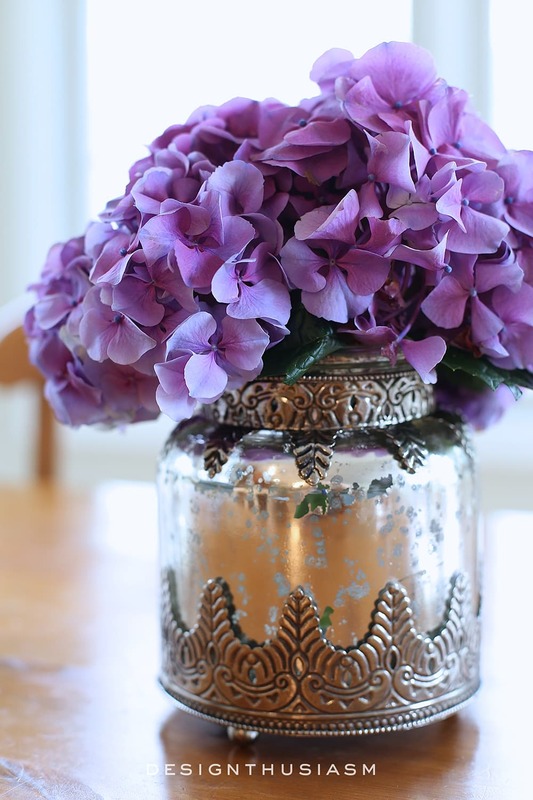 Love the big purple hydrangea- It’s gorgeous and looks wonderful in the silver vase. 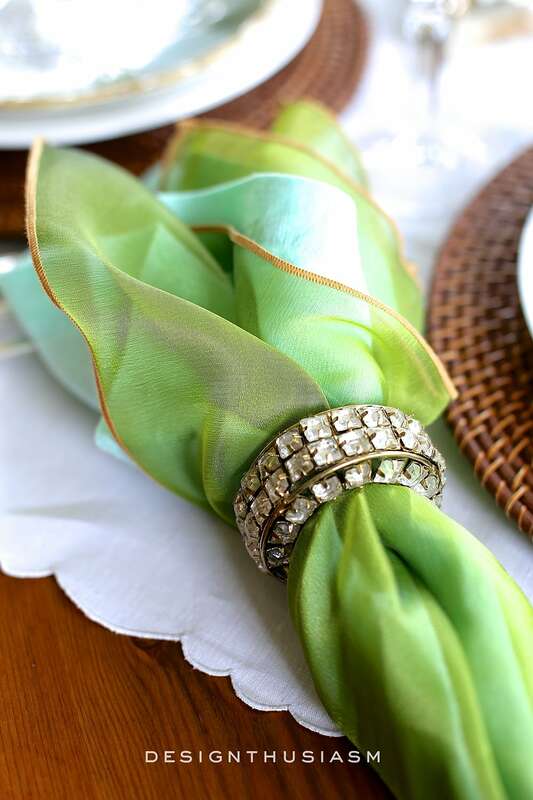 The layered napkins and pretty diamond like napkin rings are beautiful and elegant! Thanks, Liz! The purple hydrangeas actually drove the whole look of this table. When I went for flowers, they were what looked the best, and the rest followed from there… 🙂 Thanks for stopping by!! I L.O.V.E. those plates! Please don’t let them sit in a cupboard. If you ever tire of them, send them my way. So pretty! Great job on your table. Love the combination of bling with the natural look of the plates. Ha ha, nothing sits in my cupboard for too long… 🙂 Everything gets used!! Thanks for visiting! 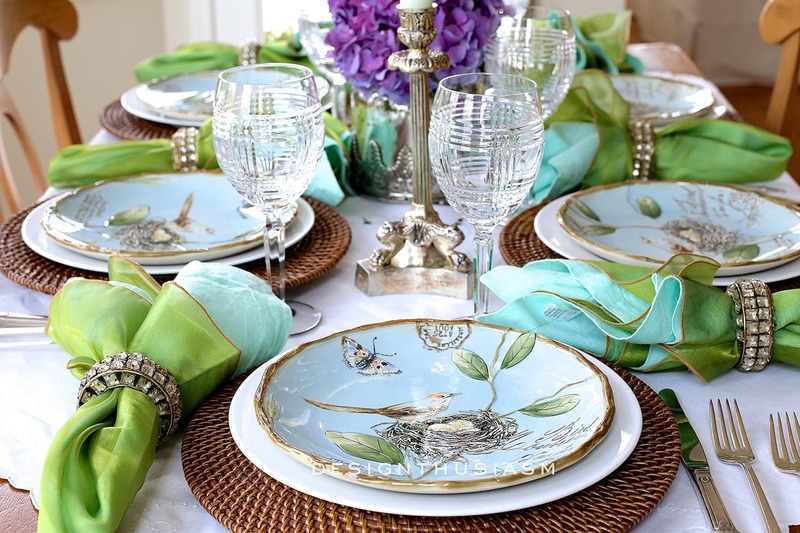 Beautiful table and great use of your plates. 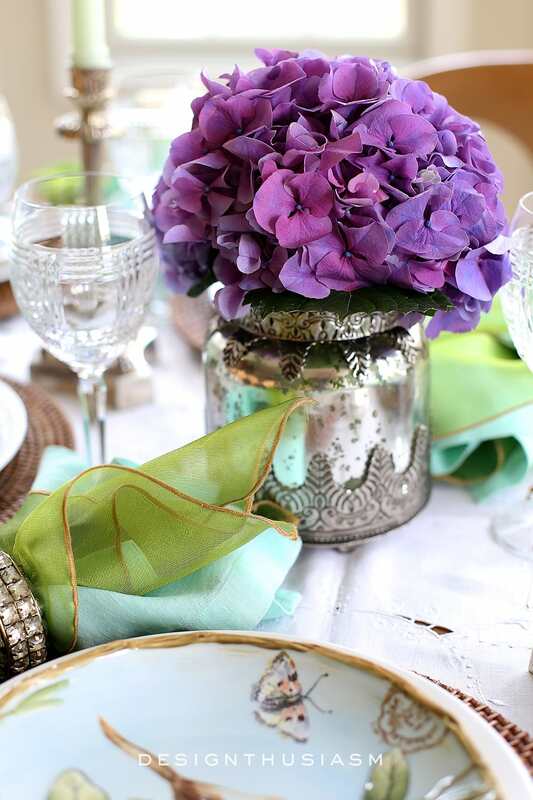 Love the purple hydrangea in the vase. The napkins look stunning with the napkin rings. Lory, this table is stunning! I have to admit that I ordered these plates after seeing your Springy Seder tablescape. I truly love what you have done this time in bringing out the green. Your tables are so elegant! 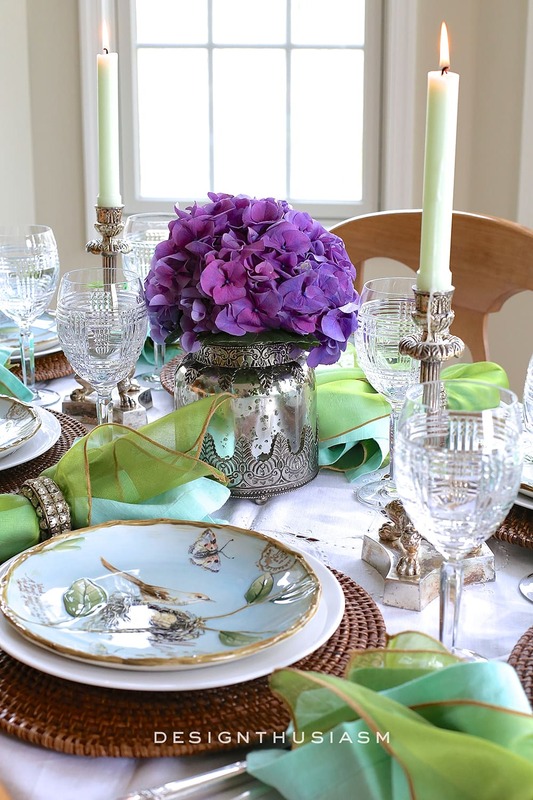 I love to set pretty tables for my friends and am thrilled to have found your blog. I have gotten so many wonderful ideas. I enjoy following you on Facebook, too. Thank you so much, Martha! Every time I think blogging is just too difficult to keep up with I read a comment like this and it inspires me to keep going… 🙂 Thanks for visiting! !